Happy Holidays to all of you! I'm just finishing up my challenge entry--first time to use a wonderful new stamp I got last year. Thanks for your wonderful products! 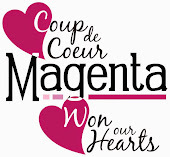 Happy Holidays to all of you at Magenta! !